When it's hot as blazes or as cold as ice, certain dishes can make the day go smoother, such as gazpacho during summer or chicken soup when it's wintry. It turns out, according to a forthcoming study, that seasonal variations do indeed play a role in the types of menu items Americans tend to buy when they're eating out, something restaurateurs will want to be mindful of in their ongoing efforts to optimize their supply chain. As first reported by Restaurant Dive, the multi-pronged study, spearheaded by researchers at the Ohio State University, analyzed approximately 3,200 comments left by diners in Central Florida, each of whom had consumed meals at fast-casual dining facilities in the area. The team also surveyed 200 restaurant frequenters in other parts of the country as well. "Rain, barometric pressure and air temperature played the largest variables in diners' food moods." By the study's conclusion, rain, barometric pressure and air temperature played the largest variables in diners' food moods, the researchers found. Milos Bujisic, assistant professor at OSU's Department of Human Sciences, told Restaurant Dive that this was particularly the case for air temperature, as certain foods were ordered more often depending on whether it was quite warm or cold out. What didn't play as big of a role in terms of sales was inclement conditions, specifically rain. What menu items did patrons dine on more or less often? 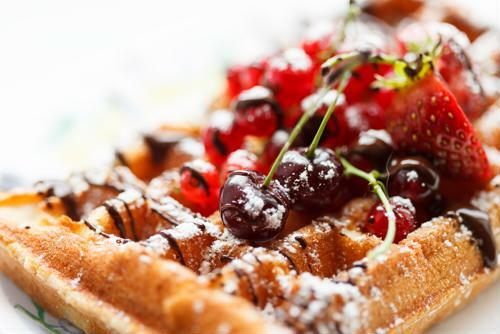 The biggest differentiator was Belgian waffles, Bujisic explained. Kitchen staffs received fewer requests for this breakfast food specialty when temperatures were on the warmer side of normal. French toast was another breakfast item staple that notably dropped in frequency when mercury levels rose. Interestingly, Bujisic added, people went out for brunch and lunch less often when Mother Nature brought warmer conditions. "[This] makes sense," Bujisic said. "In Florida, the highest heat is during lunch time." Indeed, generally speaking, temperatures are at their hottest in the average day between the hours of 10 a.m. and 2 p.m., as this is the window wherein the sun's rays are the most direct. So, how can restaurateurs use this information to inform their advertising and supply chain strategies? When it's warm out - particularly during the summer - it may behoove eateries to drop prices for these less-commonly ordered dishes in order to stimulate requests, researchers said. They may also want to develop promotions that can better call attention to them. Although it's unclear when the study will be released to the public, Bujisic noted that his hope is restaurants, particularly the small and independent ones, can use it in their planning, in terms of supply chain management and establishing price points. "Restaurants, especially mom-and-pops, are still relying on the gut feeling of the owner on what is going to be sold," Bujisic explained. Hard data can be leveraged in order to make more informed business decisions. That being said, the restaurant industry is still highly influenced by consumer trends, and they use them to determine what types of dishes will be the most likely to resonate with the dining public. For instance, based on a recent poll from the National Restaurant Association, 70 percent of chefs said they're confident that globally inspired breakfast foods will be a top food trend in 2019, with 67 percent also pointing to hyper-local foods.